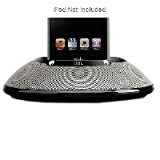 The JBL On Stage Micro portable docking sound system is the perfect travel partner for your iPod. Imagine the convenience of taking the JBL On Stage Micro system on the road or enjoying the sound anywhere you happen to be. Connected to your iPod, MP3 player, computer, or other music source, it produces clean, powerful sound. It charges your iPod and also provides a USB pass-through to connect to your computer. With the JBL On Stage Micro system's IR remote control, you have all the power with your digital music experience.